Federal Judge Extends Order Blocking 3D Gun Blueprints From Internet Defense Distributed can't publish its DIY gun designs online until a court case between the states and the federal government is resolved. But the designs are already circulating. 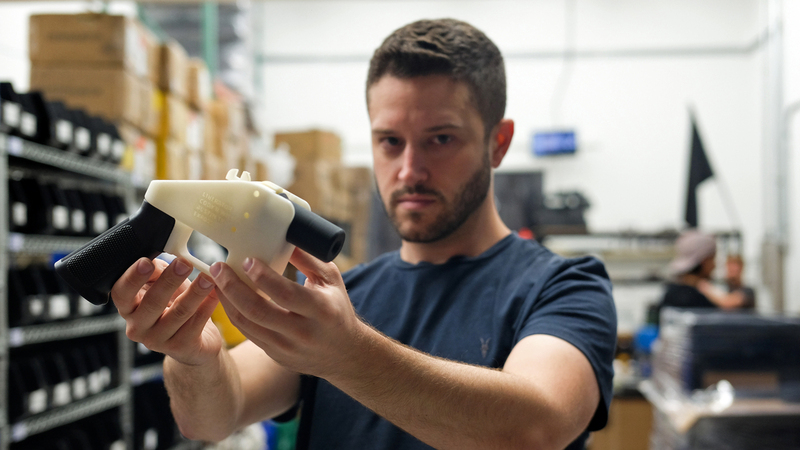 Cody Wilson, owner of Defense Distributed, holds a 3D printed gun called the "Liberator" in his factory in Austin, Texas, on Aug. 1. But the restraining order and preliminary injunction are a bit like closing the barn door after the 3D-printed horse has bolted, as Matt Largey of member station KUT notes: "Defense Distributed had posted the plans online for four days late last month. They were downloaded thousands of times and are being shared on other sites." And as the court order specifies, the files can still legally be "emailed, mailed, securely transmitted or otherwise published within the United States." It's also legal for Americans to make their own guns for personal use, as long as those guns set off metal detectors and show up on X-ray machines. If you're 3D printing part of a gun and using metal components for other parts, as some designs call for, no law is violated. However, one of the Defense Distributed designs is virtually all plastic, except for a metal firing pin. Critics say that design will allow illegal, undetectable guns to proliferate. However, skeptics note that design is not very reliable compared to guns with metal parts. Instead of focusing on how exactly the guns are made, the court battles over Defense Distributed have centered on export law, freedom of speech and the proper procedures for changing federal policy. The legal saga that stretches back years, as NPR's Vanessa Romo reported in late July. The Obama administration had blocked the distribution of the blueprints, arguing that posting a blueprint for a 3D-printed gun online amounts to "exporting" the gun, because it can be downloaded by people outside the U.S.
Cody Wilson, the owner of Defense Distributed, said that posting the designs is a question of free speech, not of weapons exports. He also cited his Second Amendment rights. Earlier this summer, the Trump administration and Defense Distributed reached a settlement that allowed some designs to be posted online. That prompted a new lawsuit by 19 states and the District of Columbia, filed against the State Department, alleging that the federal government did not provide enough warning about the change in policy. The states also say the government didn't provide a reasonable explanation for the change. The State Department said the decision was strictly about exports, and therefore can't cause any harm to the states. U.S. District Judge Lasnik was not impressed by this argument, saying it "ignores reality and is wholly unpersuasive." "The fact is that the internet is both domestic and international," he wrote. Allowing them to be posted online means Americans can download them, which could promote the proliferation of plastic guns, which could affect state governments as they try to enforce gun laws. "It takes virtually no imagination to perceive the direct connection," Lasnik wrote. He also wasn't impressed with the State Department's argument that possessing a fully plastic gun is already illegal, and the law will be enforced. "[I]t is of small comfort to know that, once an undetectable firearm has been used to kill a citizen of Delaware or Rhode Island or Vermont, the federal government will seek to prosecute a weapons charge in federal court while the state pursues a murder conviction in state court," he wrote. In a tweet Wilson, the founder of Defense Distributed, highlighted a portion of the order that acknowledges it partially limited his freedom of speech, and wrote "FARCE." Washington State Attorney General Bob Ferguson, who represented the states that sought the injunction, criticized the Trump administration for attempting to make the plans easier to access. "Once again, I'm glad we put a stop to this dangerous policy," he wrote in a statement.